1) Please, NO talking to the Lure Operator while a dog is within the lure coursing field (inside the barrier fencing) and especially while a dog is running! 2) Please pick up after your dogs! (Don't forget doodie bags!) Thanks in advance! 3) NO peeing on our belongings- including our fencing. Thanks, again, in advance! 4) Dogs must be healthy and in good physical condition. (No injuries, recent surgeries, communicable diseases and not on medication.) We run in public parks so to prevent severe illness in puppies they must have completed their 2nd set of vaccinations. If your puppy has not completed the 2nd set of vaccines stay away from public areas until completed. 7) ALL dogs must be held securely leashed or be crated and supervised at all times! Please do NOT tie dogs to anything - find somebody strong to hold them securely! NO retractable leashes! 8) Please respect the space (allow at least 10 feet) of unfamiliar dogs. Ask before coming closer (people and dogs). Keep an extra eye on small children. 9) We will attempt two lure types to entice your dog. Sorry, NO refunds if your dog just doesn't seem interested. (See "FYI, Suggestions…" etc.) Sell any remaining runs to another lure course runner. 10) NO people aggressive dogs. NO dog aggressive dogs. NO exceptions. Out-of-control dogs, highly aroused and out of control and aggressive dogs will be asked to leave (no refunds). We will temporarily halt runs until out-of-control and aggressive dogs are out of the area. 11) The lure course operator will use careful judgment and reserves the right to excuse or ban a dog or handler or owner from tired dog good dog open field lure coursing without refund for any or no reason whatsoever. 12) Please be patient: while we are performing routine maintenance or repairs on our equipment. Refunds will be given for cancellations, including, but not limited to, weather, equipment damage or failures, or other reasons requiring cancellation of the event. 13) If your dog has attacked lure coursing pulleys or machines in the past- PLEASE tell the Lure Operator! 14) These rules may be changed at any time with or without notice as current conditions warrant. 3) If you are bringing more than one dog, be sure to bring a friend or make a friend there to hold the dogs that aren't running. Be sure to ask before coming within 10 feet of unfamiliar dogs. Do NOT tie dogs to anything! 4) You may run your dog more than once. You may run your dogs as many times as it remains safe and within the physical fitness level, controllable arousal level and ability of your dog. Use good judgment and remember- you can come back another day! Consult your veterinarian for any restrictions or guidelines specific to your dog. Do not to run them while on medications, sick, injured or recovering from surgery. Do not feed your dog before, during or after running. The Lure Operator will use careful judgment and will not run a dog if it is not safe. 5) We are dedicated to the safety and well-being of your dog. Don't hesitate to ask ANY questions. Let us know if you would like to walk the field before running your dog. We can probably perform some maintenance at that time. 6) Bring LOTS of water. Some for you to drink, some for your dogs to drink (small, frequent sips of water are probably safe), and some to pour on your dogs to cool them down. We will supply a few "community" buckets of water if no public water facilities are nearby, but our supply is limited. 7) Bring earplugs/walkman/iPod! 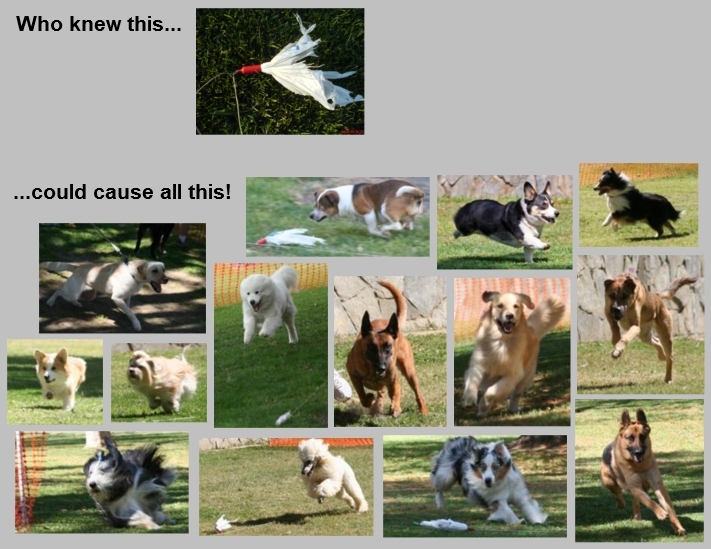 Lure coursing makes dogs absolutely crazy! Crazy dogs bark a lot! 8) Bring cameras & friends to take videos/pictures...capture the face of pure excitement to review and laugh at again and again! There will be so much going on you will miss the moment! 9) Bring a comfortable chair/sunscreen/hat/sunglasses/sun shade. You might stay longer than you had planned. Lure coursing can be VERY entertaining and even relaxing to some! 10) For some events you may request a time slot to possibly save $$ and time. (And it will give us some idea of how many runs to expect!) tdgd Addicts with confirmed time slots will be placed in line first followed by walk-up's. 11) Please be patient while we are performing routine maintenance or repairs on our equipment. Refunds will be given or checks returned due to cancellations, including, but not limited to, weather, equipment damage or failures, or other reasons requiring cancellation/discontinuation of the event. If an event cancels within 24 hours of the scheduled date, we will make every attempt to notify those with confirmed time slots via email and possibly by phone. 12) If there is any way we could improve let us know. If there is something we are especially great at let us know...everyone loves compliments!! Tell us in person or write your comments in the "Comments" section of the "Contact Us" form at http://www.tireddoggooddog.weebly.com.